The large hunter needs room to move about his stand without being hampered or uncomfortable. In fact, space to move is essential for getting off an accurate shot when that moment of truth arrives. Many hunters can recall a missed opportunity due to movement restrictions. In addition to roominess, security and safety of a larger climbing stand is important. A larger hunter needs the comfort of knowing a treestand can fully support his weight. Just as its name implies, the Goliath SD Climbing Treestand, from Summit Treestands, is big, tough and designed specifically for the larger hunter. This full-featured climbing stand provides the big-framed hunter with both the room and security necessary for a safe and effective hunt. The Goliath SD Climbing treestand boasts an ample 350-pound limit and extra room, making it a solid choice for the bigger hunter or for anyone looking for additional space in the stand. The Goliath SD Climbing Treestand is an enlarged version of Summit’s popular Viper Treestand. In addition to its increased weight capacity, the Goliath offers a wider top that provides more room to move. 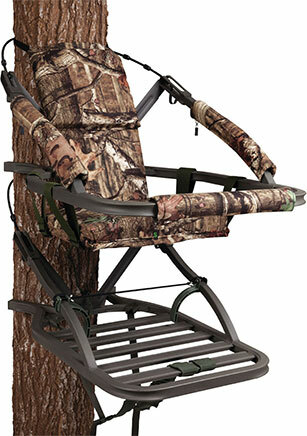 A larger more comfortable seat also ensures the big-framed hunter will be able to sit comfortably in his stand all day long if needed, which is an important feature when waiting for the big one. Understanding the importance of silence and concealment on the hunt, Summit Treestand designers built the Goliath with both in mind. The Goliath features Summit’s Dead Metal sound-deadening (SD) technology to minimize noise in the stand. Summit's Dead Metal sound-deadening technology works by filling in critical parts of the platform with a custom engineered expanding foam to reduce unintentional noises caused by movement on the platform. Mossy Oak Breakup Infinity Cover on all of the treestand padding offers the essential concealment hunters need for success. When it comes to treestands, nothing is more important than safety. The folks at Summit want to make sure all hunters – big and small – are safe in their stands. For this reason, Summit uses high-quality extruded aluminum and SummitLokt with precision welds for absolute rigidity and maximum strength. Every joint is locked into place before welding and each joint is designed so stress on the weld is minimized, resulting in a noise-free stand that is strong, safe and secure. Time is of the essence when hunting. The sooner a hunter can get up a tree and setup, the more time available to hunt. Summit's QuickDraw Cable retention system allows for quick prep time and gets hunters ready to climb in no time. This important innovations is one of the fastest and quietest cable-attachment system ever invented. Once the cable is sized for the tree diameter, the hunter simply has to insert the cable into the QuickDraw bracket of the suspension arm, pull the trigger and the cable securely locks into place. There’s no fumbling with pins, knobs, nuts or bolts, and the attachment is absolutely secure and silent. Once the hunter is ready to climb, he’ll appreciate the fast and easy-to-use RapidClimb Climbing Stirrups. The stirrups are ergonomically shaped and adjustable to fit any boot and are offered as a standard feature on all Summit climbing stands. Goliath SD Climbing Treestand comes complete with a four-point safety harness and is covered by Summit’s Five-Year Limited Warranty. For more information about Summit Treestands, please visit www.summitstands.com.